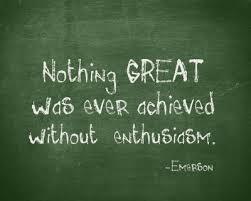 Enthusiasm is the driving force behind any action. Entheos, “possessed by a God”. Without it there will be no attraction to your action. Not only will it inspire you, it will energize everyone around you too. Enthusiasm will propel you to get into the zone. When you are engaged in an activity that you love, enthusiasm, is the steam that keeps you moving in the direction of your dream. Even if you are doing work that is not to your liking, but have a dream, enthusiasm, will propel you to keep doing what your doing until you can success. Without it you will be doomed to conformity and monotony. So envision the desired outcome you want to achieve and back it with enthusiasm. It is the vital force behind any great achievement. So begin at once to kindle the fire, and little by little it will build into a roaring flame of enthusiasm and ignite everything and everyone around you. This entry was posted on Wednesday, August 14th, 2013 at 1:57 pm and is filed under Born Rich Learning System. You can follow any responses to this entry through the RSS 2.0 feed. You can leave a response, or trackback from your own site.